Iron sights have been with us ever since muskets were rifled. Sharpshooters demanded more and thus began the revolution and evolution of iron sights. Backup iron sights, on the other hand, grew from the need for redundancy as optics sprouted up on the barrels and rails of military and hunting rifles. Fast forward a few decades and an innovative and driven company introduced the concept of plastic to iron sights. In 2009 Magpul released its first generation of MBUS polymer back up sights aptly named MBUS for Magpul Back Up Sight since iron was essentially absent from the design. Calling them iron sights would be misleading especially when it was discovered that some polymer front sights melted when attached directly to gas blocks and other gun parts that got a little toasty during sustained fire. The Gen2 MBUS sights arrived in 2011 further pushing the design and public acceptance of critical gun components made of polymer. Coincidentally, some of the same complaints about plastic pieces on military guns echoed the concerns with the original Stoner M16 design when the US Air Force was the first to adopt it back in 1962. Today almost every rifle has a thermoplastic, polymer or fiberglass version, but perhaps not a wood stock one. But still there was the melting issue. And, of course, the engineering restlessness we’ve come to love from Magpul. Nothing is off limits and nothing is off the table. Even though the Gen2 MBUS was arguably the most popular branded backup “iron” sight in history, it had its limits. In addition to temperature sensitivity, the MBUS gained strength through size. Polymer can bend, and if there is one thing we do not accept from our sights, its movement so the sights had to be larger than their ferris or aluminium brethren. While the design of the MBUS was good enough, just being good enough was not good enough so Magpul released the MBUS Pro sight in 2013. Rail space was another concern. As aftermarket accessories started to crowd the top rail of our rifles, we looked for ways to squeeze every slot out of our Picatinnys. The MBUS was not huge by any measure, but other options did free up an extra rail slot. The metal design of the MBUS Pro did raise the weight a little with the difference between the rear sight about the weight of a single .223 round, and the difference between fronts sights about half that. The rear MBUS Pro, like it’s predecessor, is a standard AR height so it perfectly co-witnesses with the A2 front sight post as well as many red dot and holographic sights. Also like its polymer partner, the Pro has same-plane dual apertures for close and far shots. Aperture or peep sights are vastly superior to open sights, especially as backups. Painting your front sight post on the target is much easier when peeping through a small hole than lining up a row of pillars hoping the center one is the front one. Add the stress of losing your primary targeting system and now having to play the game of “which sight post is not like the others” and you’ve got the makings for a missed shot. 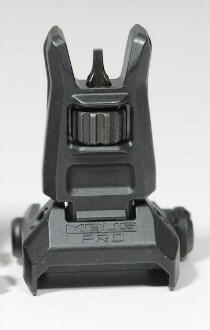 But unlike its predecessor, the deployment of the MBUS Pro sight is not spring loaded. The Pro requires the user to move the sight into its upright and lightly locked position much like its ancient ancestors. Manually raised aperture sights of the tang and ladder variety have been commonplace since the late 1800s. Frankly, I don’t miss the MBUS spring, and actually prefer the simpler design because the sight won’t loudly snap to attention with an errant push. While I appreciate the help the Magpul spring offers me deploying the regular MBUS, most often I dampened the snap with my fingers anyway so I’m pleased that the Pro has eliminated the middleman. 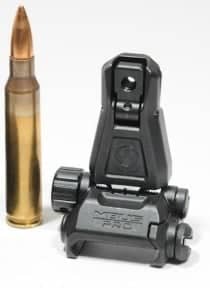 It’s been reported that a loose hold on a .308 or larger rifle using the MBUS Pro sights might allow the recoil to move the sight towards its stowed position, but I could never get anything like that to happen. But I do like the fact that if I punch the business end of my rifle into an immovable object or even thicket of branches, the sight will fold back rather than continue to fight with the obstacle. Since the MBUS Pro sights are highly traditional at targeting, the main things to note are how well and how easy the sights adjust for windage and elevation. 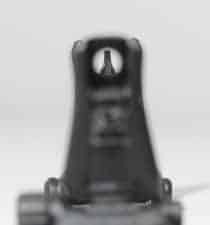 The rear sight has a reasonably large knob on the right side that screws the aperture left or right with 12 positive clicks per rotation. Compared to the MBUS, the Pro’s windage knob is smaller but thicker, and definitely easier to turn. However if your hands are cold or wet, turning either knob is a real feat of finger strength. The polymer MBUS front sight had the anachronistic post height adjustment that carried with it the same need for a special tool that has haunted the design since it’s birth on the first M16A1 front sight. The Pro front sight employs the classic quarter-turn click of the sight post, but instead of requiring a pronged tool to grab the post from the top, a knurled knob sits below and perpendicular to the sight spinning it up or down. A common concern with tool-free adjustments is that the post might wander on its own or with a little help from the bumps of an active life. Apparently this was an issue where Magpul wanted to err on the side of harder to move rather than easier to adjust. So if you have trouble racking the slide of any auto pistol larger than a .22, you will struggle to adjust these sights without gloves or pliers. Another major design difference of the Pro sight over the polymer MBUS is that the rail clamp on the Pro can be attached without sliding the sight onto the rail as with the original design. Normally this is not a problem since the sights are usually the bookends on the top rail, but drop-on placement is noticeably better. A minor but welcome difference when comparing the rear Pro to the polymer the lack of peripheral obstruction to to the right and left of the peep hole. With the MBUS Pro, all the parts are contained in a triangular housing while the Gen2 MBUS has protective extra wings that while not large, do slightly reduce some of the situational awareness while concentrating on your target because the sight is so close to your eye. A strange thing about BUIS is the BU part. If all goes well, then the sights will never be needed. However, as a reader of Survival Cache/SHTFBlog you are no doubt interested in outfitting your backup systems with the same care as your primary ones. In isolation, the MSRP of a pair of MBUS Pro sights seems high since you could get a very nice survival knife for the same cost or less. In fact, you could get quite a few nice things for the pair of Benjamin Franklins you need to toss down for the pair of Pros. But in the world of performance back up iron sights, the price of the MBUS Pros is similar or even less than other popular options. There are many BUIS options flying around in the rarefied air of high quality (Troy Battle Sights), and the MBUS Pros fit right in. Each brand has features, options, and colors that go beyond the utilitarian aspects of backing up the the primary sighting system. But as evidence for our collective quest for something better, an interesting phenomenon took place reminiscent of Apple Computer’s new product announcements in that between Magpul’s press release about the forthcoming MBUS Pro sights and their actual shipping to dealers six months later, I found myself in more than a few conversations about what the sights would offer over the usual (and quite fine, I might add) selection of BUIS already on the store shelves. In other words, Magpul had generated quite a buzz for a common product that they did not yet sell and we were talking about it. 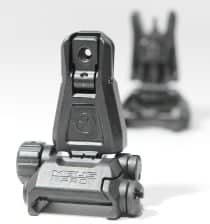 As further evidence of the anticipated popularity of the MBUS Pro sights, overseas counterfeiters launched their knock-off product line prior to Magpul’s actual shipping the sight to distributors. Not one to take things lying down, Magpul has initiated a lawsuit against the counterfeiters and those who sell their wares (Read lawsuit). But the real launch of the MBUS Pro was not without its own hiccups. 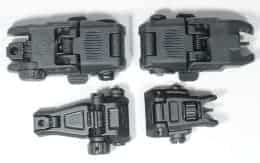 Some of the early rear units sat a little askew on the rail favoring the right more than they should. As an early adopter of the Pro sights, I got one of the right-leaning sights. Magpul, whose customer service is stellar, was quick to replace the sight with a perfectly balanced one. I’d like to note that my experiences with the Gen2 MBUS did require a service call to the Magpul mother-ship as well when a deployment lever would continuously catch on the edge of the rail and stymie any forward progress of the sight’s launch into active space. In the interest of finding something to complain about, some early bloggers and firearms forum posters questioned the metal composition noting that it was not forged or CNC machined, but in fact metal injection molded or MIM. MIM is not new, nor is is something rare in Magpul’s product line. Regardless of the advantage of MIM for small, complex parts manufactured in volume, some worried about it’s strength. Personally, I have no concerns in this area for two reasons. I do have experience with polymer and aluminum BUIS, and these MIM BUIS feel stronger and more dense than either of the other materials. Further, should an issue arise, and the end of the world is still a few weeks away, Magpul, an American company making products in America, will stand behind these sights just as they do all their equipment.